Today’s recipe is super simple but absolutely delicious Penne pasta in Creamy Alfredo Sauce.This can be prepared in less than 30 minutes of time with probably just 10 minutes of active time in front of the stove. I am always over stocked on pasta- to deal with any kinds of emergencies! Whether it is to cook a quick meal for my toddler or to make a filling easy main course for a party. This is a basic sauce recipe which can be tweaked in a number of ways.You can replace the tomatoes with mushrooms or broccoli.You can also use dried herbs instead of fresh basil if you cant find any. 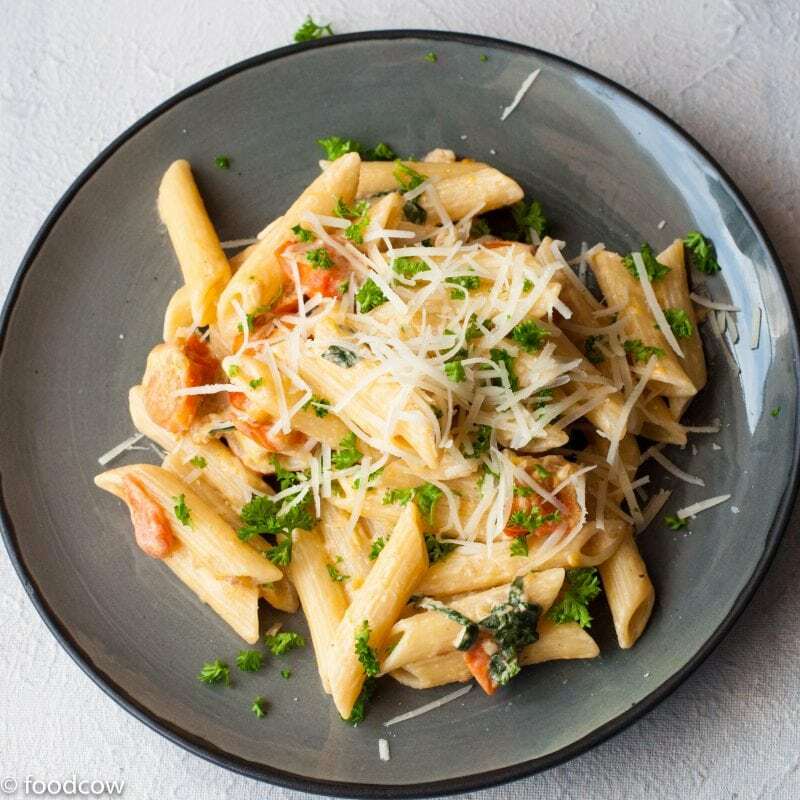 To make this Penne pasta in Creamy Alfredo Sauce vegan- Use any non dairy cream instead.You can see how to make almond milk at home here. Some tips to make your Pasta taste better! Always boil pasta in salty water; the boiling water should taste like sea water! Don’t throw away the cooking water but use the pasta water to lighten the sauce. Once hot, add garlic and sauté. Add the tomatoes and sauté for 60 seconds. Pour in the Cream.Add the basil.Cook for 30 seconds. Add the left over pasta water to thin the sauce. Next,Add the grated parmesan and cook till it melts. Mix the sauce with the cooked penne pasta. Garnish with some parsley and parmesan and serve immediately.